← What a little hero! Earlier this week I whizzed down to south Wales in the hope of photographing peregrines at their nest site on a limestone cliff-face. It did not take me long to find another photographer with long lens and tripod and I knew I had come to the right place. He told me that the peregrine “chick” was about to leave the nest. It had been jumping around on the ledge and flapping its wings powerfully. Had I arrived just in time? Over the next few hours a real drama unfolded. This was Springwatch in real time! The “chick” did indeed appear to be ready to go. Its parents were using various tactics to entice it off the ledge. An adult brought food in but instead of taking it to the youngster circled in front of the cliff-face with it. Food was brought to a ledge a few yards from the youngster and the parent stood there with it. The whole cliff-face was raucous with the sounds of peregrines calling. After a while the latter tactic succeeded. The youngster scrambled and flapped its way to its parent where it was given a few scraps of meat. The adult flew off. The chick was then left with the dilemma of what to do next. “I’ll scream and flap” it must have thought – because that is what it did. There was some concern among the assembled throng – now numbering four birders with long lenses – that it would fly before it was ready and tumble into the river below. One had been rescued from the mud a few years ago. But the cliff was perhaps not quite as sheer as it seemed because the youngster flapped and tumbled a few more ledges downwards until it was perhaps twelve feet below its nest. It eventually found what appeared to be a pinnacle almost surrounded by sheer drops. There was surely no going back now…… It flapped and lurched. Almost! This was the biggest moment in its short life but one could almost imagine what it was going through. More flapping and another lurch or two. Then it was away. It swept confidently down over the river then up and back to an oak tree on the cliff-top. It landed tidily – no crash-landing for me, thank you very much! – and stayed there. Meanwhile the parents had taken separate stances on the cliff and appeared very relaxed. 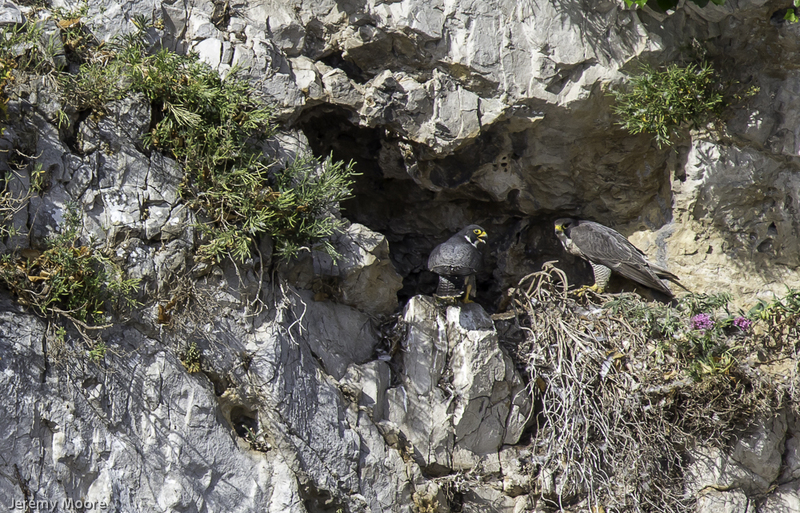 Doing what peregrines do so well most of the time – nothing. There will still be plenty for them to do, of course; the youngster will be unable to catch its own prey for weeks and will need further lessons from mum and dad on how to go about it. But by the time I left about 9pm that was still the state of play. It was a case of excellent timing (for once!) on my part and a thrilling chance to watch what can normally only be seen on television. The photograph – showing both adults, with the stunningly handsome male on the left – illustrates what excellent results the new Tamron 150-600 “superzoom” is capable of. I may have bought one of the early batch of this lens which needs a return to the importers for a “fix” before it can operate to its fullest potential. Nevertheless I consider myself very lucky to have got one when they were (and still are) in such short supply. It has brought my bird photography up to a new level. This entry was posted in Uncategorized and tagged fledge, fledging, Peregrine falcon, tamron 150-600 lens. Bookmark the permalink.